It's a Shah Rukh Khan film. He plays Bauwa Singh, a vertically challenged person who has immense swag. He thinks he was born to love 'em and leave 'em, but until he understands the meaning of love, he's a zero..
At first go, 'Zero' makes you light and easy, which is good, but the problem is that it doesn’t really take you on that flight of entertainment, which you set out for. On the whole, ZERO has several factors going for it: star presence, winsome performances, energetic soundtrack and of course, it’s timed during the Christmas and New Year vacations. Sadly, the weak, flawed and lacklustre screenwriting is all that you recall after you’ve watched the much-awaited movie. This one’s an epic disappointment! Words Fail Me, But I Have to Write a Review! 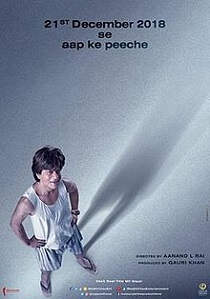 Zero is a funny film backed by a unique storyline and embellished with interesting elements like space travel that you may not have seen in Bollywood films before. The film is a wholesome entertainer you can sit back and enjoy. Shah Rukh Khan is lovely as are the two leading ladies Anushka Sharma and Katrina Kaif. Zero makes for the perfect weekend plan with family and friends. ZERO Has Everything You Want To See In A Good Film! Raise Your Head High For Bauua Singh!